Tyler Madden does a snow angel after scoring the winner 51 seconds into overtime Monday night at TD Garden. The Huskies beat BU in the Beanpot semi-finals, and will take on BC in the final next week. A crowd of 12,413 cheered in TD Garden on Monday night as the Huskies faced the Boston University Terriers in this year’s Beanpot semi-final. As defending champion, Northeastern was determined to keep the title they fought so hard for last season when they became the first NU team in 30 years to win the tournament. Including last year’s championship match, the two teams have battled to take home the Beanpot four times in the last five years. Northeastern racked up 49 shots, but the game went to overtime 1-1 as both goalies seemed to be unflappable. Fifty-one seconds into overtime, though, Tyler Madden went in a breakaway and barely, just barely squeezed the puck through Jake Oettinger and in to send NU to the final to face Boston College next Monday. Two Huskies storm a loose puck in front of Oettinger, but they're stopped by the junior goalie. NU started strong in the first period. Senior forward Patrick Schule put the first goal of the evening on the scoreboard for the Huskies just 3:14 into regulation, scoring off a pass from senior forward Liam Pecararo, after creating a turnover on the forecheck. The Huskies held their own throughout the majority of the first, giving hope to NU fans that the team had finally shaken whatever has been putting them off their game recently. 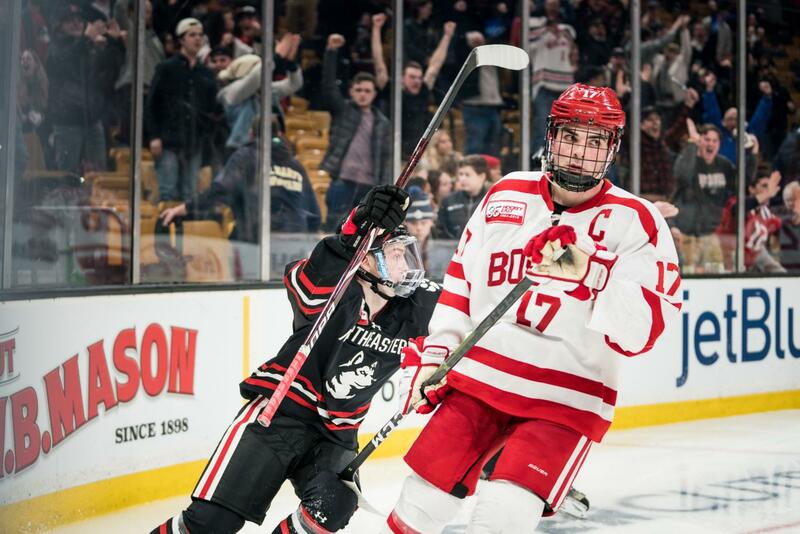 With just 21 seconds to go in the period, however, the Terriers reminded their opponents that they are a forced to be reckoned with when freshman forward Joel Farabee, BU’s leading scorer, slipped one past Primeau off of a rebound. The scoreboard remained stagnant at 1-1 throughout the rest of regulation as the puck went back and forth across the rink. There was excellent goaltending on both sides; BU junior goaltender Jake Oettinger notched an astounding 47 saves, 24 of which occurred in the third period alone. NU sophomore goaltender Cayden Primeau also performed admirably, saving 26 throughout the game, including some high-danger ones in the third. “We had confidence and we knew that we were not leaving this building without a win. That was the message going throughout the locker room,” Primeau said of the team’s transition into overtime play. Tyler Madden celebrates scoring the winning goal in overtime as Northeastern took down Boston University in the first round of the Beanpot. The match came to an end under a minute into overtime, when standout freshman forward Tyler Madden slipped one past Oettinger off of a crisp pass from junior defender Jeremy Davies. Boston College took down Harvard, 2-1, in the early game Monday, meaning the Huskies will take on the Eagles in the Beanpot championship game next Monday at TD Garden.